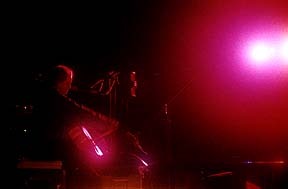 The first time I experienced the music of David Darling, it was in the winter of '88. I was fresh off a 747 in Albuquerque, New Mexico, crossing the Rio Grande and driving into a desert landscape. Nothing like the power of memory when it comes to first impressions. This was my first escape from the green of the East. 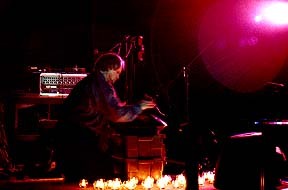 The song in the air was Wu Wei, a collaborative effort with Michael Jones from a 1987 Narada release called "Amber". This song would became the theme to my journey, to the views of Canyon DeChelly, the Grand Canyon, the buttes of Monument Valley, and let me never ever forget the oh-so-starry desert night sky. Thirteen years later, the man and Jeff Towne make a deal and, cello in hand, Mr. Darling comes to our place. I pounce to my pew. After an intro by Keith Brand, WXPN's weekend morning show (Sleepy Hollow) host, the lights dim. Reflected in blue, center stage, sits David Darling. During the performance's opening twenty minutes, our show is what we came to expect; it's all artist and cello. Dazzling cello, melodic cello, evocative cello, intense cello...all in one continuous diversified piece that above all reveal Darling's talents as an accomplished cellist. After one moment of weighted mournfulness, I recall Darling instantly shifting to a John Adams ''Shaker Loops"-like intensity, his actions a blur, hair flying all which ways, an effect most exhilarating and dizzying. Later he would sing. He would sing of lost shoe laces. He would sing to his mother, speaking as a boy, asking her to explain violence. He would sing to his cello. His cello would sing back. The man and his instrument, it was almost like making love. In a sequence at the start of his second set, Darling started by scatting most Ella Fitzgerald-like, keeping a mirror-imagine pace plucking on his cello. A moment later he wailed into a microphone ALA a Tibetan monk, before chanting rapidly in perfect Sheila Chandra style. Then came a tongue clicking and clucking sequence, uh huh, before finalizing this bizarre piece with a shriek the likes of even, say, Meredith Monk would have been proud of. Here, after all this ingenious near madness, and as a perfect example of a show in constant transition, his bow rode softly across the cello, and there to be heard was only the sound of his strings, resonating sorrow, beauty, and understanding. Those sadder moments of tranquility, ultimately, are what David Darling does best. The second set concluded with an audience participation effected rendition of "Remember", the beautiful final piece from Darling's CD "Eight String Religion." I'm still humming this now, three days later. The Gatherers would request an encore and get its wish. This turned out most whimsical, as Darling had us humming, clapping our hands and, I lie not, stomping our feet along to his sound. Go figure. But it worked all night long. Another night full of first's at The Gathering. The first time for a solo cello player; the first time an artist performed wearing a neck tie. ; the first group participation (finger snap, floor stomp, hand clap, tongue pop and group hum). While the audience was of a different mix than most gatherings, the vibe was the same. Enchanted! 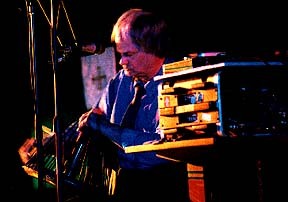 David Darling is a master of his instrument. So confident and skillful as he sent the acoustic cello thru a series of delays and reverb. He accompanied himself with simple loops as to fill out his sound but not to be rapacious. He took his cello for a walk off the front of the stage down and the center isle. He even played a Swiss percussion instrument that sounded like a small steel drum. Two sets of 45 minutes each were played without a break between the pieces. He moved seamlessly from all-out improvs to composed pieces from his solo recordings. The second set included one of the most unusual use of voice and digital delay that mixed several octaves of grunts and growns rhythmically. Like the cave man meets the beat poet (slightly reminiscent of the voice piece by Jeff Greinke many Gatherings ago). 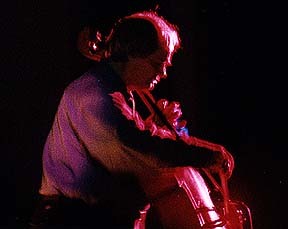 David proved himself to be a performer that gave the crowd something they wanted but didn't expect from him and his cello. His recordings now seem even more intriguing. I believe Darling to be one of the core artists who've helped develop this type of music from scratch, just because it needs to exist. From his background at the ECM label he has continued to stretch the boundaries of the listener while providing some of the most beautiful soundscapes ever recorded. 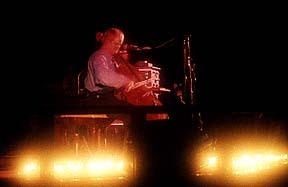 I hope his newest recording "Cello Blue" effects as many people as "Eight String Religion" did. All the best to you David.